Confucius once said, "A man without a moustache is a man without a soul." If you agree (and why wouldn't you? 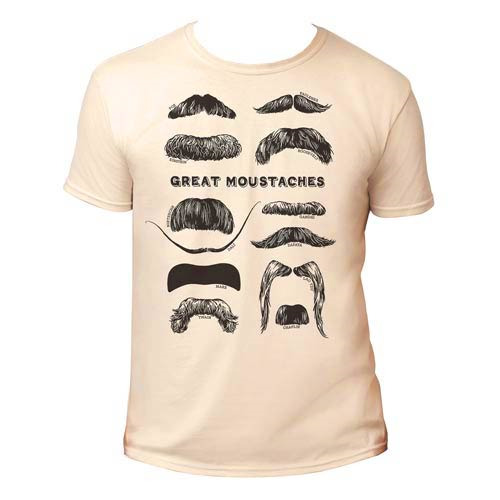 ), then you should be wearing a Great Moustaches T-Shirt. This unique shirt is a real attention-getter. It features the famous moustaches of Albert Einstein, William Faulkner, Theodore Roosevelt, Friedrich Nietzsche, Mahatma Gandhi, Leon Trotsky, Salvador Dali, Groucho Marx, Lao Tzu, Charlie Chaplin, Emiliano Zapata, and Mark Twain. With this shirt, facial hair has never been more fashionable!